When you are a decision maker you need to be sure you are acting on reliable information. You need to be aware of your business risks and know that they are managed effectively. You need faith in your underlying systems and controls and the certainty that you are compliant with all appliable legal requirements. Moreover, you need to be able to instil your shareholders, investors and customers with the same confidence. As chartered public accountants we provide the assurance and audit services that you need based from our office in Munich and for all entities located in Germany. Based on the size of a Company there are statutory audit requirements in Germany. Also, some international groups might have audit requirements for German entities although the local thresholds are not exceeded. As charted accountants / CPA and accounting professionals in Germany we believe that we should deliver value that goes beyond confirmation of your financial results and an assessment of your controls environment, supported by recommendations for their improvement. We can provide statutory auditing services for German GAAP financial statements as well as audits based on international standards on auditing. We also perform internal audits and due diligences based on international standards or your requests. Auditors/audit firms have the exclusive right to perform statutory audits and to issue opinions thereon. The auditor must report on the audit. In particular, the auditor must confirm that the financial statements reflect a true and fair view of the company's situation. Mention must also be made of all material negative changes in net worth, financial position, and results, as well as of material losses that could jeopardize the going-concern assumption. Unlike in some other European countries, it is professional practice to prepare long-form audit reports. The auditor’s opinion included in the report (but not the rest of the report) must be published by the companies along with their financial statements. “We have audited the financial statements, including the accounting system, and the management report of the company for the fiscal year from ... to .… The legal representatives of the Company are responsible for the accounting and preparation of the financial statements and management report in compliance with German commercial law (and the supplementary regulations in the articles of incorporation / partnership agreement). Our responsibility is to express an opinion, based on our audit, on the financial statements, including the accounting, and on the management report. We conducted our audit of the financial statements pursuant to §317 of the German Commercial Code (HGB) and in compliance with the generally accepted standards of auditing prescribed by the Institute of Certified Auditors in Germany (Institut der Wirtschaftsprüfer, IDW). 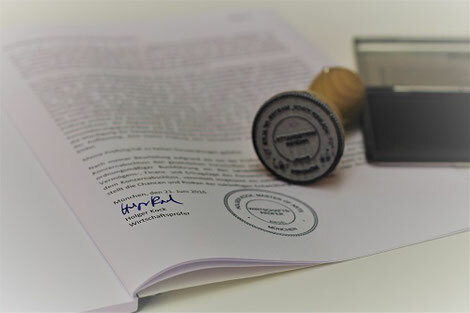 Those standards require that we plan and perform the audit to obtain reasonable assurance that inaccuracies and violations are recognized which significantly affect the presentation of the net worth, financial position and results as conveyed by the financial statements, in compliance with generally accepted accounting principles, and by the management report. The scope of the audit was planned taking into account our understanding of business operations, the Company’s economic and legal environment, and any potential errors anticipated. In the course of the audit, the effectiveness of the system of internal accounting controls was assessed, and the disclosures made in the accounting, financial statements and management report were verified, mainly on a test basis. The audit also includes assessing the accounting principles used and significant estimates made by the legal representatives, as well as evaluating the overall presentation of the financial statements and the management report. We believe that our audit provides a reasonable basis for our opinion. Our audit did not give any cause for qualification. The standard auditor's opinion must be modified, if additional comments appear necessary in order to avoid creating a misleading impression of the scope of the audit and the scope of the opinion, or if single entity and consolidated financial statements are combined in one set. Reference to the company’s statutes is to be made if they contain accounting-related regulations. If there are objections, the auditor must qualify or disclaim his opinion. The objections must be explained in the opinion. Additions to the opinion like those described above do not represent qualifications. According to statistics provided by the professional organizations, additions, qualifications, or disclaimers usually occur in less than 5% of cases. It should be noted that the auditor's opinion refers to the financial statements as prepared. The auditor is not responsible for the publication of these financial statements.